As a teenager, I obsessed over the Final Fantasy series. I’d get lost in the many-dozen-hour adventures, absorbing the convoluted but often emotional plots and devising tactics to overcome the challenging encounters. Truth be told, I spent much, much more time writing about the games on fan sites and message boards, and it’s what pushed me towards writing professionally. I’m ever grateful for that unexpected career path borne out of pure fandom. But these days, I don’t play the games anymore—or any other role-playing quests, for that matter. I just don’t have time, between work and raising a rambunctious toddler, much as I’d like to relive that excitement at times. So maybe Final Fantasy: Record Keeper is designed for folks like me: It pulls in familiar, beloved elements from past entries while being super streamlined and playable for minutes at a time. Still, Square Enix’s latest free-to-play attempt begs the question: does anyone love Final Fantasy for the dry, turn-based combat above all? Every bit of gameplay takes place on screens like this, albeit with different backdrops and characters. You can even hit “Auto” and watch the battles instead of playing them. Final Fantasy: Record Keeper is essentially a mega-mash-up of all the main Final Fantasy games from various consoles and eras. 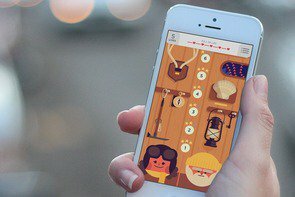 It brings together characters, scenarios, story tidbits, weapons, music, and graphics from some of the most enduringly loved games ever created—all in a free-to-play iPhone and iPad game, amazingly. The premise is expectedly thin, with you as the newest employee of a vault that houses the various series’ events. When an evil affliction starts damaging paintings that depict the classic moments, it’s your job to jump in and revitalize them by reliving the battles. It’s a fair excuse to effectively smash together content from nearly three decades’ worth of role-playing adventures, and do so in a way that works on touch devices. And that’s done via a nearly complete focus on turn-based showdowns. You’ll assemble a five-character squad of fighters, mages, and more, and then engage in battles against monsters and iconic villains from the series. Each encounter finds you tapping a command icon—attack, defend, use a spell—and then watching as the events unfold, making lightly strategic moves as needed. Battles are bundled three or four in a row without a breather, typically, meaning that you’ll need to be mindful of health and magic allotments across a series rather than a single fight. Each mission is spread out across multiple events, with each of those spanning a few total battles. As you can see, the stamina requirements add up, but at least early on, it’s not really a detriment. Curiously, there’s little actual storytelling and zero exploration in the mix: It’s all menu-driven, as you go from battle to battle advancing each game’s plot solely through combat. And the combat itself isn’t all that exciting; after all, you tap a button and watch the battles instead of playing them. The little bit of narrative you get comes via text descriptions and the occasional old-school screenshot, which—paired with the amazing classic music—is enough to evoke memories for old fans. However, I doubt it’ll make much of an impact on anyone who isn’t already well versed with the console games. Also surprising is the somewhat limited launch content. To be fair, we’re only a couple weeks out from the North American launch—but I’m still surprised that only a small selection of story missions is included. Currently, you’ll play through battles from Final Fantasy IV through VII, as well as Final Fantasy X, but the missions only span a very compact chunk of each. For example, there are just two short missions for FFVII, which come from the initial scenarios of that 50-plus hour adventure. 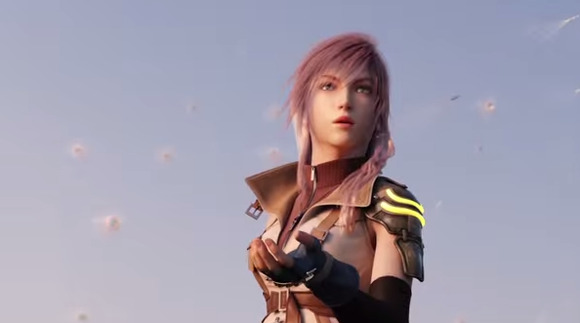 While that means that there’s probably a whole lot more coming, between content from other Final Fantasy games and expanding what’s here, the game doesn’t feel as sprawling and endless at its core as a lot of free-to-play experiences do. But much tougher master missions and daily challenges flank the 20-or-so current story quests, and provide some incentive to dig in—and maybe spend some money, too. 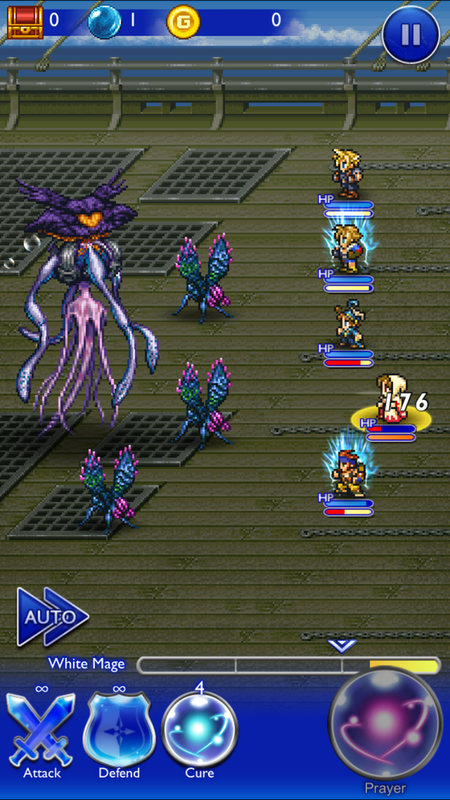 Spending mythril or gems on a Rare Relic Draw can earn you some rare, powerful gear to use in combat. 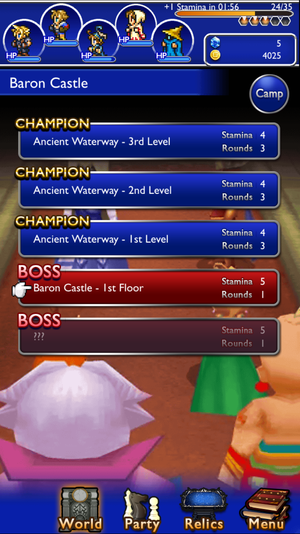 Surprisingly, Final Fantasy: Record Keeper doesn’t feel like a total grind. It has a stamina system designed to limit prolonged play, along with opportunities to invest real money to unlock randomly chosen rare items, but the game is very hands-off with its monetizing attempts. I played hours and hours of Record Keeper, yet never once ran out of stamina. It recharges at a rate of one crystal every few minutes, plus each battle takes away a few—and they’re chained together, remember, so a single mission might take 15 to 30 stamina crystals away in the span of 10 to 15 minutes. But your maximum capacity increases regularly, each time refilling the bar. Anytime I came close to tapping out, like clockwork it would refill and I’d be ready for the next adventure. Where money can come into play is with the Rare Relic Draws, which let you spend big to try and unlock top-rated, memorable gear from the various games. 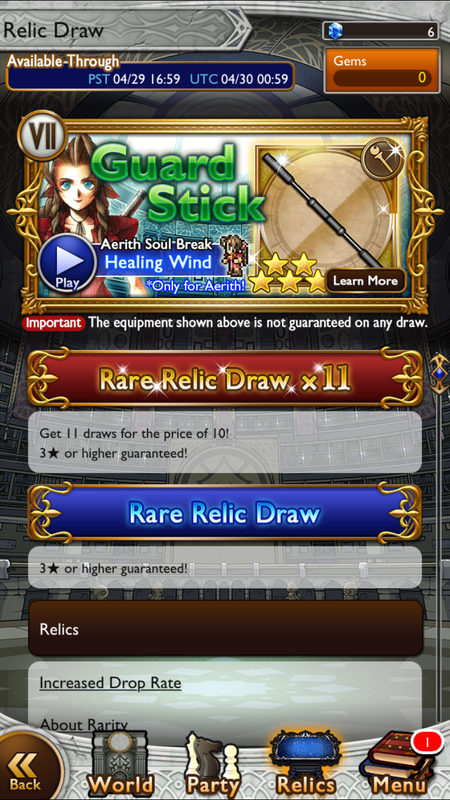 You’ll occasionally earn mythril rocks to use as currency, and those can be used to tap into a Rare Relic Draw. However, it accumulates so slowly that it’s much more tempting to pour in some cash for gems and buy a bunch of draws at once. In fact, DeNA and Square Enix will happily sell you 11 draws for the price of 10—but it costs almost $30 to buy enough gems to jump on that supposed bargain. Likewise, a single draw purchased with gems will set you back $3, and there’s no guarantee of what kind of gear you’ll win. 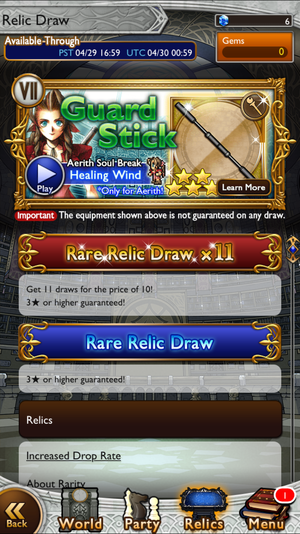 Tempted by the possibility of winning the Guard Stick weapon from Aerith—a fondly remembered character from Final Fantasy VII—I spent $9 for three item draws in the current Relic promotion. I didn’t get the item I wanted. But the weapon and armor pieces I did win gave my characters noticeable stat boosts, and if I found myself deeply hooked by Record Keeper, I might see it as a fair investment. 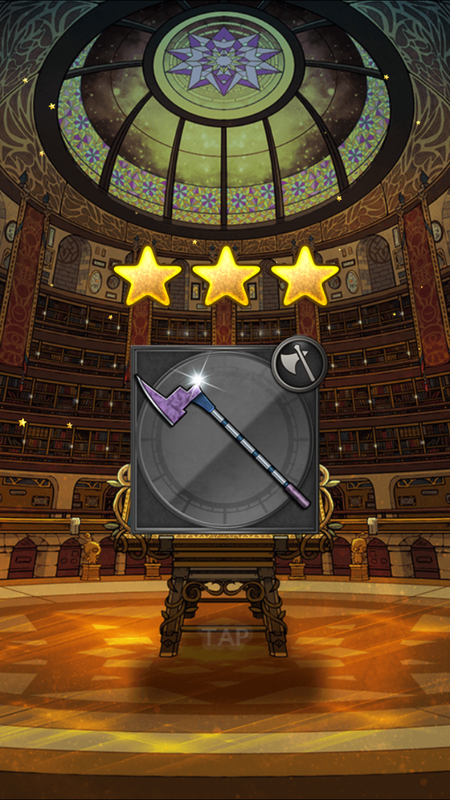 But I’m not that invested, and I doubt that I’ll spend any additional money—although I’ll probably pop back in from time to time to survey the new content and see if Final Fantasy: Record Keeper becomes any more interesting over time. It does a nice job of stoking excitement via respectful treatments of adored characters and stories, but falls short of making the experience feel essential or fully realized. Still, die-hards should enjoy the flashbacks, and it’s a much better freemium attempt than Square Enix’s earlier Final Fantasy: All the Bravest. There’s so much potential here to bring together all of these universes over time, and perhaps pack in unique gameplay tweaks and more challenge with the main story quests. Hopefully, as the game grows and expands, it’ll maintain the reasonable free-to-play design and not squander the nostalgic goodwill it’s drawn thus far.